USS Seawolf Shot Down TWA 800-Unproven! - Truth or Fiction? USS Seawolf Shot Down TWA 800-Unproven! An article alleges that a senior staff member of former Secretary of the Navy John Dalton confirmed that a missile fired from the submarine USS Seawolf shot down TWA flight 800 in July 1996. Various conspiracy theories have persisted since TWA flight 800 exploded near long island in 1996, but sufficient evidence doesn’t exist to support any of them. The most recent conspiracy theory echoes similar claims that the airplane was taken down by a surface-to-air missile strike. The story fails to name a credible source and remains unproven. In fact, the National Transportation and Safety Board (NTSB) rejected a petition to reopen the investigation into the crash in July 2013 based on similar claims. The petitioners, a group called the TWA 800 Project, claimed a“detonation or high-velocity explosion” caused the crash. Among the petitioners was former NTSB Investigator Hank Hughes. The NTSB held a media briefing in front of the reconstructed Boeing 737 in which investigators said there was no way a missile or bomb destroyed the airplane in July 2013. Hughes and other former NTSB staff members who were critical of the investigation were not allowed to attend, Flying Magazine reports. A documentary, “TWA Flight 800,” that aired on cable television on the anniversary of the crash in 2013 also fueled skepticism. Former NTSB Board Member John Goglia, who spent four years investigating the crash in the 1990s, said the petition and film don’t add up in a column published by Forbes in June 2013. 4) aircraft wreckage that was inconsistent with a center fuel tank explosion. In addition, they allege a conspiracy by the NTSB and FBI to destroy and cover-up evidence. Goglia contends that eyewitness accounts of a “flash” in the sky just before the airplane blew up were not supported by radar evidence. The fuselage wreckage also did not show any evidence of an explosion next to the aircraft. The film ignores significant physical evidence that the center fuel tank exploded. More specifically, the evidence indicates that the fuel tank over-pressurized, tore apart significant wing structure and ejected pieces from inside the fuel tank. Those inner fuel tank pieces were found in the “red” debris field – that is the debris field closest to JFK, where the aircraft took off, indicating that the fuel tank pieces were among the first pieces to leave the aircraft. The aircraft fuel tank and surrounding floor and ceiling debris show metal pieces bowed consistent with extreme pressure from inside the fuel tank. Goglia also said that nobody claimed throughout the entire investigation — including petitioner Hughes — that evidence had been tampered with or was concealed. Conspiracy theories will persist about the explosion of TWA flight 800. Unless they are accompanied by new evidence or credible sources, however, they will remain conspiracy theories. According to a senior member of the staff of then-Secretary of the Navy John Dalton, the test firing of a new generation Navy missile from the submarine USS Seawolf accidentally struck TWA flight 800 en route from New York to Paris on July 17, 1996. According to the former Navy official, the missile test was so important for the Clinton administration, it was being shown live on a Navy closed-circuit television feed at the White House. The Seawolf’s missile was to have struck a drone reportedly being towed by a Navy P-3 Orion maritime surveillance aircraft. However, to the horror of the Navy personnel involved with the test and senior White House staff gathered to witness the missile’s successful launching, it veered off course and intercepted the TWA 800 Boeing 747, killing the 230 passengers and crew on board the aircraft. ABC News Paris correspondent and former John F. Kennedy Press Secretary and U.S. Senator Pierre Salinger reported that a U.S. Navy missile, according to his sources, had downed TWA 800. A vicious smear campaign was launched against Salinger and he was eventually fired by ABC. This editor subsequently spoke at length with Salinger about both TWA 800 and Pan Am 103. We agreed that the investigations of both involved U.S. government cover-ups. The Seawolf, which had recently completed sea trials but had not yet been fully commissioned into service, was participating in a major Navy exercise off Long Island in exercise area W-105. The exercise was dubbed GLOBAL YANKEE ’96. Ironically, the Seawolf was to be commissioned in Groton, Connecticut on July 17, 1997, the anniversary of the shooting down of TWA 800, but the Navy, sensitive to the date, altered the commissioning to July 19, two days later. Margaret Dalton, the wife of Navy Secretary John Dalton, carried out the submarine’s commissioning sponsorship in Groton. The FBI initially believed that terrorism was the cause of the crash of TWA 800 and it ran a criminal investigation parallel to that of the National Transportation Safety Board (NTSB). However, as the need to cover-up the missile angle became paramount, the FBI changed modes and began harassing witnesses who clearly saw a bright streak or arc in the sky moments before the massive explosion tore apart the Boeing 747 sending bodies and debris into the Atlantic Ocean. Two Air National Guard Blackhawk helicopter pilots saw an orange-red streak prior to the fireball while conducting helicopter training approaches at nearby Gabreski Field. But the missile theory never could be put to rest. Senator Alphonse d’Amato (R-NY) said he believed a missile struck TWA 800, as did a number of individuals with military and flight experience. D’Amato served on the President’s Commission on Aviation Security and Terrorism (PCAST), which was set up in September 1989 to make aviation security recommendations after the bombing of Pan Am 103 over Lockerbie, Scotland. In 1993, D’Amato opposed funding any more Seawolf submarines, however, as they were built by the Groton, Connecticut-based Electric Boat Division of General Dynamics, the two Connecticut senators, Joseph Lieberman and Christopher Dodd, were strong proponents of the submarines the Navy said they did not even need in the post-Cold War era. The unfolding events surrounding the Seawolf’s missile impact on TWA 800 was witnessed in real-time in the White House Situation Room by startled officials who were viewing what was suppose have been a successful intercept of a drone. However, according to our Secretary of the Navy senior staff source, as the impact of what transpired dawned on White House officials, the director of the White House Situation Room, Vice Admiral Kevin Cosgriff, immediately ordered the mobilization of Navy and other military assets to cover up the Navy’s role in the disaster. As the National Security Council’s director of Systems and Planning, Cosgriff was partly responsible for obtaining the White House Situation Room to show-off the Navy’s latest missile capabilities to gathered civilian and military officials. The crew of the P-3 that was towing the drone was immediately transferred to new assignments. 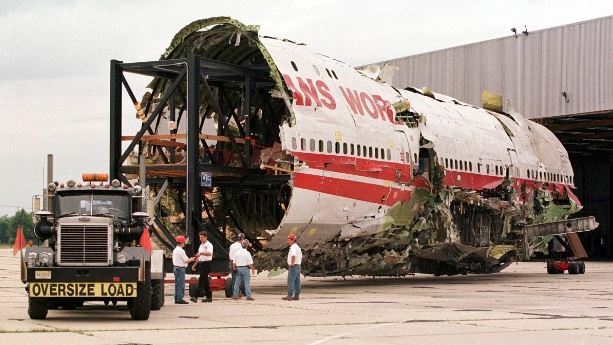 The P-3’s number 3 engine showed signs of damage from the explosion of TWA 800 and maintenance records on the engine were suppressed by the Navy. Three other submarines participating in GLOBAL YANKEE ’96 were also ordered out of the area. They were the USS Albuquerque, the USS Augusta, and the USS Trepang. The FBI accounted for all missiles aboard the three submarines but not those on board the Seawolf, which was not yet officially commissioned into service and which had just completed it sea trials a little over a week earlier. 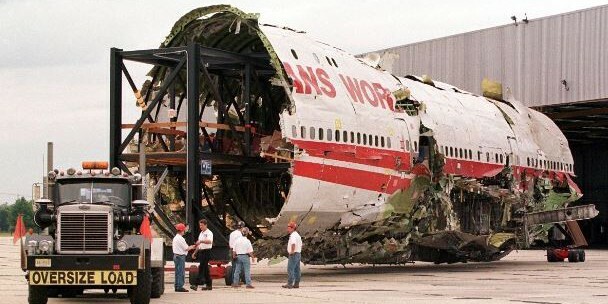 Our source confirmed that US Navy SEAL team members were dispatched to recover TWA 800 wreckage with the sole intent being the alteration of the debris to fit the story of a defective fuel tank explosion. Two U.S. Navy salvage ships, the USS Grasp and USS Grapple, were sent to Long Island waters to recover TWA wreckage. One of the submarine’s that was ordered to immediately leave the area of the TWA crash was the Seawolf. The Seawolf was testing a missile that could be fired on an enemy aircraft while the submarine was fully submerged. The Navy ordered all radar data of the incident seized. The Navy and other U.S. agencies subsequently altered data tapes to be consistent with the NTSB’s contrived conclusion that TWA 800 was brought down by a spontaneous explosion in the center wing fuel tank. Radar tapes showing the P-3 at 20,000 feet and a towed drone at 17,600 feet at about a mile behind the P-3 were erased. The CIA developed an animation to bolster the center wing fuel tank explosion explanation. The Seawolf’s Cooperative Engagement Capability, which linked its weapon systems with the Aegis radar systems installed on other Navy ships participating in the exercise, also saw its data purged. Once the subsurface missile was launched, the Seawolf’s combat software no longer had control over the missile. The Navy’s Aegis training platform, the Combat System Engineering Development Site (CSEDS), located in the middle of a cornfield in Moorestown, New Jersey, off of the New Jersey Turnpike, which had a AEGIS SPY-1 radar window off Long Island, also saw its data tapes confiscated as did the Federal Aviation Administration control center in Islip, Long Island and the FAA technical center in Atlantic City, New Jersey. A Lockheed-Martin engineer who worked at CSEDS in Moorestown said the SPY-1 radar was reported to be “down for maintenance” during the exercise, an exercise in which it was to have been a participant. The NTSB falsified data in their cover-up, billed as an investigation. The Flight Data Recorder’s indication that something struck the Boeing 747 was brushed aside. Hank Hughes, a former senior NTSB accident investigator, revealed in 2013 that evidence that a “high-velocity debris exiting the right side of the aircraft.” Hughes said evidence was tampered with. Other NTSB investigators joined Hughes in criticizing the NTSB’s “accident” report. Testing done by the Brookhaven and Sandia National Laboratories could yield no evidence that TWA 800 was brought down as the result of a mechanical failure. 20:31:11 Intact and climbing 747 approaches 13,800 feet. 20:31:12 U.S. Navy subsurface-launched missile impacts TWA 800 at 13,800 feet. Beginning of decapitation process. 20:31:47 Massive fireball explodes in the falling wreckage at 7500 feet. 20:31:43 Wreckage begins hitting the water’s surface. 20:31:55-20:31:57 splashdown of the massive fireball flames.